Restaurant Pro Express - Latest Version, Enterprise Edition. Priced per station - call for quantity purchases. To be used for businesses with multiple physical locations (multi-store operation). Increase your restaurant's efficiency and profitability. Restaurant Pro Express will help you take orders and check out customers faster. 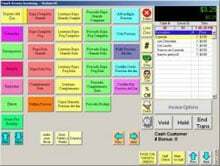 It is the first Windows based Point of Sale Management System designed for restaurants, bars and fast food restaurants. Restaurant Pro Express is the solution to all your cash register problems. Whether you want to manage your wait staff or servers, track orders, and more, Restaurant Pro Express is your best choice. It is also touch screen compatible. The Restaurant Pro Express RPEENT is also known as Restaurant-Pro-Express	RPEENT	.